My Parish 2009, part 2. Back in June 2009, I had a dilemma. 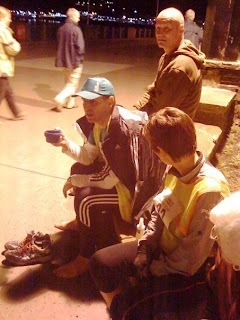 About three weeks before the race, Helen let me know that she had entered and would take part if she was feeling okay. In the meantime she would get somebody to be my support crew. Now one thing anyone who has taken part in the Parish knows is that you must have complete trust in whoever looks after you. You're wandering in the countryside in the middle of the night, close to exhaustion, which is why most people rely on a spouse. I found that Helen was great for me as she had a slightly masochistic streak which not only makes her a good personal trainer, it also means there is no sympathy to my moans and groans, especially as she had done the Parish in 2001. So, I was a little wary to the point where I wondered if I would be even starting. "What did you do?" I asked Helen. "Go up to the other women at the school gates and ask if they'd drive through the night looking after a mad stranger?" "Er, yes!" was her reply. I met Pauline Bridson on the Thursday afternoon at Helen's. She rushed in, said Hi, spoke about 20 sentences in the next 3 minutes and then rushed out. Like a hurricane. Apparently Helen had asked her to support me and she said, okay, it's something different, it might be a laugh. I'd trained with Martin pretty hard and was looking to get into the top 20. We set off from the rented place in Jurby about seven am, but thanks to traffic didn't get there until quarter to eight, so, after a couple of photos found ourselves right at the back. Helen arrived at 5 to, and was even further back. I'd agreed with Martin we'd keep in touch by phone but I'd go on ahead. 5.4.3.2.1, and it was 8am and we were off. Being at the back was frustrating, trying to get past everyone without pushing or looking impatient. By the time I got to the start line, the front runners were halfway round the track. I said hello to Irene Taggart as I passed her, I'd walked with her and Michael Bonney in 2007 from before Lonan to near the finish. Out of the Stadium and I was passing dozens. At Braddon estate I caught up with Michael Bonney himself and walked with him for ten minutes or so, chatting, before pushing on. I got with the leading pack around Braaid but had made the mistake of starting too fast. 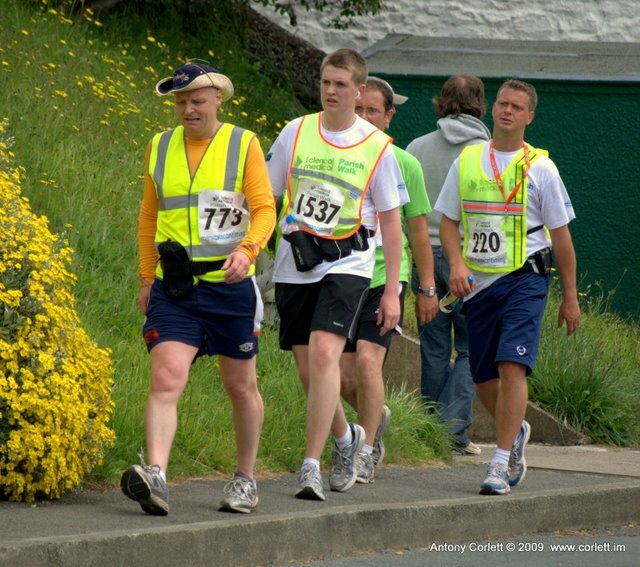 Martin, 773, on the left in the funny hat! I got into the top twenty, but was tired and found the sloc difficult for the first time, struggling into Peel in 19th place. The photo on the blog page is me passing through Peel. I didn't pass anyone else during the race, but made sure no-one passed me. Just after Bride (up to 18th, one had dropped out) I got the message that Martin had dropped out at Jurby with severe blistering of both feet. This was a big blow as I thought he had the will to finish. Credit to him though, he returned home, had a bath, sorted his feet out so he could hobble, then came to each church to support me. The first time I had someone looking out for me. Support is good in any form, and it really spurred me on. My old injury on my right heel had opened up by Maughold though (Up to 15th with more drop outs), it was walkable but slowed me down. I must say that Pauline was having the time of her life and admitted it wasn't what she expected. We found a similar taste in motivational music so I got a belt of Heavy Rock whenever I passed. She made the best protein shakes on the move, smooth and no lumps, and was bossy enough to keep me eating and drinking when I wasn't feeling hungry. Speaking to a sports psychologist later, he explained my finish in 2009 by saying it was a purely mental push. I heard I was 15th from a text message from a relative following the race in the far east, thanks to the internet timing. Once I'd got that message, I wasn't going to give it up. I could see the walker in front of me, which turned out to be Chris Cale. I could also see the walker behind me. I cursed the fool who would dare to take my precious 15th place, when you're this far in the mind acts mysteriously so from Lonan to the finish I got a mental picture of this walker, out to get me, and hated him. Irrational I know, but it made sense to me. I crossed the line in 17h 43m 17s. Liz Corran asked if I wanted to sit, but surprisingly felt okay. It turned out I was so stuck on 15th place I concentrated on staying in front of 16th, not catching 14th up. I don't know if I could have done it, now I'll never know. "Hurricane" Pauline Bridson and myself, Douglas sea front, 00.55am, Sunday 21st June 2009. Martin, myself (obligatory cuppa in hand), and Maureen Moffat, soaking up the post race atmosphere. At the presentation I was surprised to see the special music and flashing lights before I went up for my trophy, as it turned out Maureen was third lady! Then they played the Superman music as I went up, humbled, but vowing to do better next year, top 10 was the next target. Helen actuall walked at a gradual pace up to Peel, not expecting to finish and said she only carried on because she hadn't pushed herself at all so had so much energy left. Maybe there's something to take from that! It's always said, start slow, finish fast. I also know theres a video clip somewhere on my computer or on a disc Pauline shot as I walked by just after the Hibernian, (Once I get to the Hibernian, i know I'm going to finish) the radio is playing Sweet Child o Mine by Guns and Roses, and we're both singing along at the top of our voices. My voice gradually fading as I pass and walk ahead.